More than two feet of new powder over 9,000 feet and still falling. Guide Dave Miller (at right) begins to cut into the snow bank to test for avalanche danger. We eventually turned back because of that. 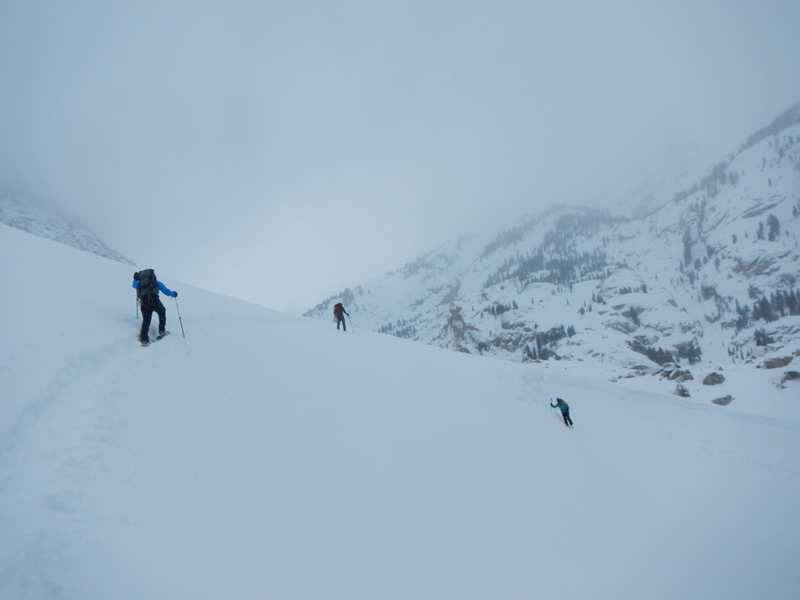 But we used this area to study the slopes, the snow and for training drills with our avalanche probes and beacons. My old Vasque Pinnacles were just not up to the job of tackling the California Matterhorn's 12,300- foot summit at the end of December. And regular hiking boots are simply not stiff enough to handle crampons and the demands of snowshoeing with a 55-pound backpack. 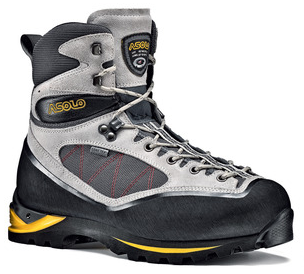 While my Vasque Pinnacles beat and battered my feet unmercifully, the Asolos were amazingly comfortable right out of the box despite the stiff sole and high (above the ankle) support. Fearing blisters, as soon as the boots arrived, I loaded up one of my packs with 40 pounds of weight plates and headed for the steepest hills around ... 15- to 25-degree slopes in the Mayacamas and on Sonoma Mountain. I kept waiting for hotspots, ready to apply tape at the first sign. But none developed: during the break-in period or the actual mountaineering. The boot outers -- a combo of waterproof leather, plastic and a Gore-Tex -- have great support but enough flex to mold easily to my foot and ankle. While there's not a lot of insulation, I never got cold toes even when it was well below zero. I wore a thin Merino-wool/polyester blend, knee-length sock as a liner and a hefty REI mid-calf wool sock over that. The Gore-Tex kept sweat from building up, so that helped as well. Others say the boots are completely waterproof, but I had no chance to test that because the high temps were well below freezing on the warmest days. The Vibram soles gripped rock and ice well and performed magnificently with both snowshoes and crampons. It takes hybrid crampons - slot at the heel, toe-clip up front. They don't come cheap" $350 at REI, but they made my snowshoeing and ice climbing experience a total blast! This shell was waterproof and warm and would be fine for snowboarding or skiing ... most any sport but mountaineering. 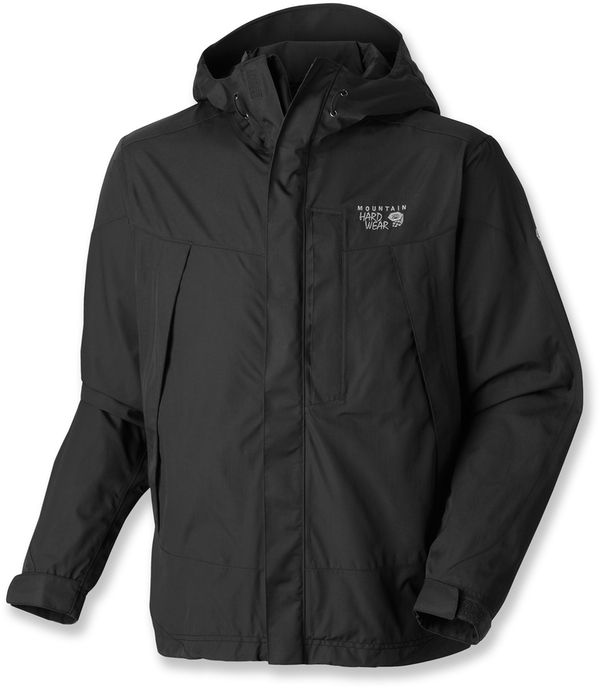 Because the Mountain Hardware' shells pockets run the entire length of the front on both sides. Which means that anything you put onto the pockets goes straight to the bottom where it's in the way of a backpack waist strap. So, every time you put on the pack, you have to squeegee pocket contents upward away from the belt ... like pushing toothpaste up in a tube. But this involves two pockets with camera, high-spf face and lip bars, lightweight gloves, pad and pen etc. That's a lot of hassle when you're trying to get the belt fastened on a 50-pound pack. Some stuff (the very things you really need to get at on the trail) get stuck below the belt. Some things get compressed between your hip and the belt. And all of the cloth layers and talus piles of of junk in the pocket makes it mostly impossible to get the right tension and support on the hip belt. REI kindly refunded my $270 with no hassles when I explained all this to them about two hours ago. Before hitting snow mountains again, I'm in the search for a proper shell for mountaineering. And better snowshoes ... I'll cover that in a future post. Useful gears for hiking. And also informative article sharing. I love your blog sharing. Impartial and fair blog, making it pleasurable for the gathering of people to peruse. Outdoorsman Lewis Perdue is a NYTimes best-selling author, entrepreneur, professor, prize-winning journalist and scientist who would always rather be pushing the limits in the middle of nowhere. From the swamps and woodlands of Mississippi to the Finger Lakes and Adirondacks of New York and the Appalachians and Blue Ridge Mountains of Virginia, Pennsylvania, Maryland and North Carolina. And Alaska from the Southeast to the bush and over to Canada's Yukon. "And for the past 30+ years in the Sierras from The Sierra Madre to The Eastern Sierra and Lake Tahoe. "I've been designing, hacking & perfecting gear for all seasons. And I still am. We don't take money under the table to hype products and services. If we have a conflict of interest (like a buddy who owns a covered product or company) then we'll tell you about that up front. If we review something that was provided for by a company, then we'll disclose that up front too. Please email me (see below) before sending anything to determine if the product is appropriate for Tactical Trekker. All non-consumable products must be accompanied by a suitable method to return the product once it is reviewed. Products that manufacturers do not want returned will be donated to charity. Those products that Tactical Trekker would like to keep will be paid for at fair market value or wholesale price whichever is higher. Prototype products still under development, not yet for sale and which a manufacturer would like us to evaluate, will be handled on a case-by-case basis consistent with the provisions above. Sending a product does not guarantee a review. Or a positive one.